Smiles are brighter in the South Lake Union neighborhood since the community discovered the convenience of visiting Downtown Seattle Dentists. There are so many different reasons for adults to see the dentist. The twice-yearly teeth cleaning and checkup is simple to schedule and keep. No matter what type of dental needs you have, it takes just a short amount of time to drop in and discuss the best way to get it done. We provide emergency dental services and orthodontic care. Your dental health is important, and regular checkups and proper care help your teeth stay strong and healthy for many years. Our professional, affordable treatment for residents of South Lake Union as well as people who work in the area makes us an ideal choice for your busy life. Dr. Anderson includes oral surgery, dental implants, and complex restorative dentistry in his list of professional skills. He is a native of Ellensburg, WA, and enjoys the practice at Downtown Seattle Dentists Office. A graduate of Boston University Goldman School of Dental Medicine, Dr. Anderson added to his expertise by completing a year-long multidisciplinary postdoctoral program at Idaho State University. He is a member of the American Dental Association. Alice Dellisanti, DDS, has a great deal of experience as an emergency dentist, extractions, and pediatric dentistry. A native of the Seattle area, she graduated from the University of Washington in 1996. She enrolled in dental studies immediately after graduation and earned a Doctorate of Dental Surgery in 2000, in addition to a scholarship and an award for pediatric excellence. She has practiced as an associate dentist in Everett and Burlington, as well as working as an associate clinical instructor to senior dental students at UW. Her recent move to Downtown Seattle Dentist puts her closer to home as she works with the residents of South Lake Union and other nearby areas. She is a member of the American Dental Association. General dentistry covers a wide range of dental conditions, diseases, and disorders. General dentistry maintains tooth health and oral hygiene by working with problems related to the face and jaw, teeth and gums. All dentists focus on preventative care, reminding patients of the importance of regular brushing, flossing, and cleaning. Dr. Anderson or Dr. Dellisanti will discuss tips for good dental hygiene and outline a program to prevent cavities and other situations. Broken or loose fillings and crowns. Extractions that need immediate attention. A root canal is an advanced method of saving a natural tooth from extraction. Your mouth is numbed with local anesthetic. The dentist drills a hole just a bit deeper than what’s needed to fix a cavity. The nerves, pulp, and blood vessels are removed from the root canal. Then the inside of the tooth and canals are cleaned and disinfected. A soft mixture much like gum is put into the tooth, which is covered with a temporary cap until a crown is made to fit the tooth. The extreme pain has already subside, and you will soon forget it was even there. Braces are a traditional way of correcting misaligned teeth. The increased number of teenagers and adults wanting to straighten their smile without using obvious metal braces and rubber bands has led to options like Invisalign. Your bite alignment is corrected with the use of custom-made straightening trays that fit the teeth and gum line. It’s easy to floss and brush using this nearly invisible method developed by the lab in response data sent in by orthodontists. Make an appointment to discuss the best option for you. Dentists have the ability to improve the look of a patient’s smile, mouth, and teeth. 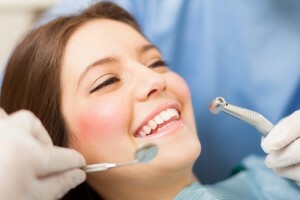 South Lake Union cosmetic dentists are able to safely whiten teeth with special bleach, reshape teeth, and close gaps. Strong materials are colored to match teeth and used to repair chips and fill cavities. You won’t believe the beautiful smile reflected in the mirror when Dr. Anderson or Dr. Dellisanti fits your teeth with custom-made porcelain veneers. The stain-resistant, thin shells cover discolorations and imperfections on your teeth. They’re designed to match the natural color of your teeth and fit into the gum line to look even more natural. Your mouth and teeth must be able to accept veneers. Impressions and X-rays will be taken and sent to the lab to be built. After they are returned, your teeth are cleaned, polishes, and buffed so the veneer fits properly. Each one is held in place by special cement. Although porcelain crowns are expensive and require several visits to reach completion, the beauty it delivers is amazing. They make a repaired tooth look natural when used to cover a large filling or broken tooth. Crowns are strong and durable. Once bonded, patients can eat just about any type of food without problems. South Lake Union dentists may recommend a bridge to cover a gap caused by a missing tooth. It prevents remaining teeth from shifting out of place. Replace missing teeth with dentures or implants. Posts hold the implants, which look, act, and feel like your natural teeth. Today’s dentures are personalized to look natural, stay in place, and help you eat the foods you enjoy. Our periodontists diagnose, treat, and prevent periodontal disease. The halitosis and abscesses related to this dental problem will disappear once the situation is corrected. Please contact us for an appointment today if you are looking for a general or cosmetic dentist in the South Lake Union, WA area.